This chapter describes how to work with labels, decisions and categorical meta-data. 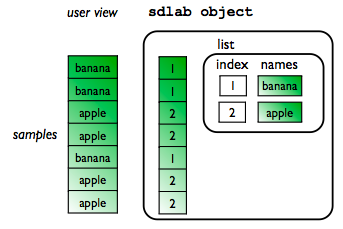 In perClass, labels, decisions and categorical information is stored in sdlab objects. In this manual, we refer to one sdlab object by the plural 'labels'. The sdlab object represents a set of observations (e.g. data samples). For each sample, it stores its class name. Unique class names present in a set of observations are accessible through the label list. The label list is a table containing all information on concepts represented by the label object. Note, that labels may represent classes to be learned by also patients, or video frames. In general, labels represent categorical meta-data. Each concept (class) has a unique string name. Each entry of the label represents one object. For example, if a label set describes sample class labels, it shows to the user one string per sample. Internally a numerical representation is used to enhance speed when using the label object. We have created a label object lab holding information on 5 data samples. The samples are labeled into two classes, 'apple' and 'banana'. Label objects may be created in many different ways, see Section Creating labels. Class name in perClass is always a string and is unique within the label set. As we can see, the list has two entries, as two are the concepts described. We created a label set for three observations. The set contains two classes (in general called groups), namely 'apple' and 'banana'. Note that for small number of classes, the label set shows also the number of samples available per group. The unique categories may be defined in several ways. Unique categories may be provided in a cell array. Note that the resulting label object contains only categories present among its entries. In our example, there is no 'apple' class in lab. For detailed information on creating and using sdlist object, see this Section. Note that sdlab discards class entries not present in the vector with indexes. This is illustrating the basic principle that sdlab always contains only classes with at least one sample. Handy shortcat for the getnames method is the unary plus (+) operator. We will get the string content above also using: +lab. Label object contains only entries for classes with at least one sample. Empty classes are removed from the list. When we search by name we may use both equal or not-equal operators on labels. The sdrelab function allows us to redefine the labeling by changing the class names or defining meta-classes. It accepts label object and a cell array with relabeling rules. Each rule is composed of source and destination specifier. The source defines the classes to be changed. As usual, it may be name, (set of) indices or a regular expression. The destination is a new name of the group defined by source. For example, lets say we want to handle lemons and bananas together as 'yellow fruit'. We have used the indices of 'lemon' and 'banana' classes as the source and 'yellow fruit' as the new class name. Because class name is always unique, we ended up with a single 'yellow fruit' class with four samples. Labels may be concatenated vertically or horizontally. Vertical concatenation means we are adding labels of other objects. The resulting label set now represent 23 objects of three classes. The label set L now uniquely identifies the cluster in a specific image. List object sdlist describes a set of concepts. Each concept has a string name. Note that the user-defined order of classes in the list is preserved. If a non-existent name is used, the conversion routine returns empty matrix . If index is out of bounds, an error is raised.